Inola Mennonite Brethren Church, ca. 1947-1952. 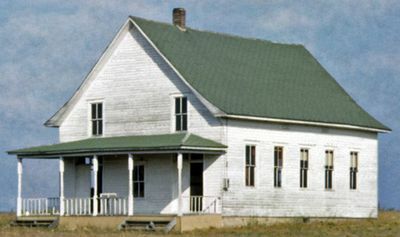 The Inola Mennonite Brethren Church in Inola, Oklahoma, USA had its beginnings in a provisional organizational meeting held on 6 December 1912, under the leadership of evangelist A. F. Strauss. Three months later a second meeting was held 21 March 1913 with a reception of members. F. F. Strauss was first elected assistant leader, and then leader of the congregation in 1914. The first services were held in the Diederle School house southwest of Inola with later services held Sunday afternoons in the Baptist Church of Inola. At that time attendance was about 60. The congregation purchased a building of their own in 1917, located in the northeast corner of Inola. The anti-German sentiment in the English-speaking community of Inola proved very difficult during World War I, particularly with regard to the "military question." On 28 June 1918 the church building burned to the ground. Sunday school attendance had reached 80 and services and classes were held in homes and schools, under the leadership of church leader Peter P. Braun. Despite the hardships and opposition, the congregation began construction of a new church building 4 miles east and 1/4 mile north of Inola on property owned by B. P. Nickel. The building was completed in May 1919 and dedicated the following year. Jacob W. Friesen was elected leader of the congregation in February 1923, with Abraham Wiens as assistant. Friesen served until 1944. Church members Alvin Epp and Edwin Nickel served as interim leaders until Henry J. Enns came to serve as leader in the fall of 1946 for a three-year period. Both Friesen (1938) and Enns (1947) were ordained to the ministry while serving at Inola. After H. J. Enns left in 1949, Epp and Nickel again took over leadership but the church struggled and decreased in membership until July 1956 when the decision was made to close. Members were urged to merge with the Collinsville Mennonite Brethren Church. The Church was described in promotional literature as "The Little White Country Church." Goertzen, Peggy. "Inola Mennonite Brethren Church (Inola, Oklahoma, USA)." Global Anabaptist Mennonite Encyclopedia Online. March 2014. Web. 22 Apr 2019. http://gameo.org/index.php?title=Inola_Mennonite_Brethren_Church_(Inola,_Oklahoma,_USA)&oldid=116416. Goertzen, Peggy. (March 2014). Inola Mennonite Brethren Church (Inola, Oklahoma, USA). Global Anabaptist Mennonite Encyclopedia Online. Retrieved 22 April 2019, from http://gameo.org/index.php?title=Inola_Mennonite_Brethren_Church_(Inola,_Oklahoma,_USA)&oldid=116416. This page was last modified on 21 March 2014, at 06:02.